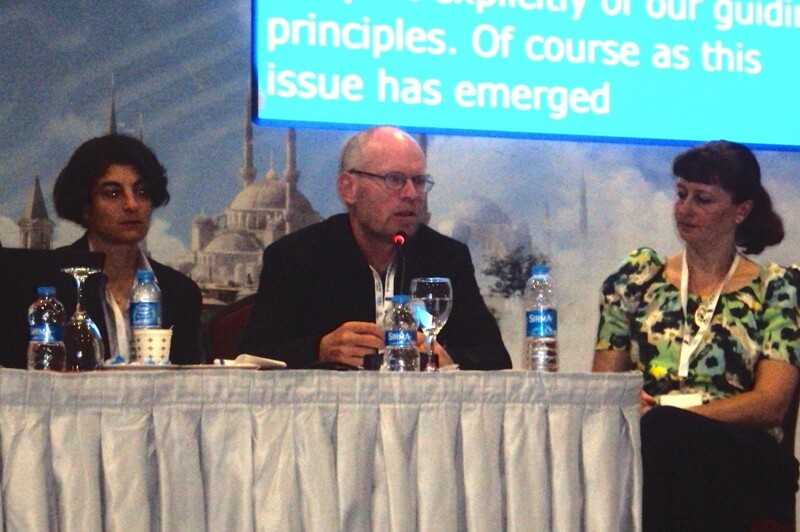 The Telecommunications Industry Dialogue took part in the Ninth Annual Internet Governance Forum in Istanbul, Turkey from 2 to 5 September 2014. Former Chairs Yves Nissim (Orange) and Patrik Hiselius (TeliaSonera) and Facilitator Lisl Brunner engaged in discussions exploring how to advance freedom of expression and privacy on the Internet and met with digital rights activists, officials from governments and intergovernmental organizations, and ICT industry representatives. Patrik Hiselius spoke on a panel on Transparency Reporting as a Tool for Internet Governance with Susan Morgan of the Global Network Initiative. Patrik explained recent transparency reports issued by Industry Dialogue members and the practical and legal challenges facing companies when they seek to publicize information on government requests for user data and content removal. Members of civil society organizations discussed how transparency reports have been used in their research and advocacy projects, and panelists agreed that governments have the primary duty to be transparent regarding the use of their powers to access communications data and to restrict the distribution of content. Yves Nissim spoke on a panel examining zero-rating practices and took part in a roundtable on human rights in which he outlined the Industry Dialogue’s contribution to the Report of the Office of the UN High Commissioner for Human Rights on The Right to Privacy in the Digital Age. On 12 September, Yves will speak at the UN Human Rights Council panel discussion on the right to privacy in the digital age. Check our Web site for updates.